I wish I could embody on paper some of the varied sensations of that seventeen days. …. Seventeen days of Hades! At the end of the first day, if anyone had told us we had to spend seventeen days there, we would have folded our hands and said it could not have been done. The Flanders Fields red poppy was introduced as a symbol of remembrance of those who died by a University of Georgia teacher, Moina Michael. Since she had volunteered for war work with the YMCA, she was called up for service as one of the overseas YMCA war workers. Although she completed her training, she was prevented from overseas service due to her age, 49. Instead of overseas service, she worked for the training headquarters. In this position she witnessed many heart-rending “goodbyes” as loved ones sent soldiers off to war. To you from failing hands we throw the torch; be yours to hold it high. If ye break faith with us who die, we shall not sleep, though poppies grow in Flanders Fields. She likened it to a spiritual quest that was calling to her. She vowed to always wear a red poppy of Flanders Fields as a sign of remembrance and establish it as an emblem for keeping the faith with all who died. Her quest was overwhelming, but she was determined to get the poppy emblem adopted as a national memorial symbol. A campaign she would take on at her own expense. The first sale of the Flanders Fields Memorial Poppy is recorded by Ms. Michael as November 9, 1918. Since then, the poppy has become a symbol of remembrance at many Memorial Day services across the country and throughout the world. 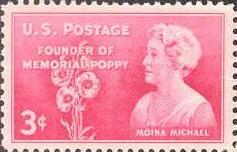 In 1948 the US Post Office honored Ms Michael for her role in founding the National Poppy movement by issuing a red 3 cent postage stamp with her likeness on it.